The LaCie 6 Big an amazing piece of technology not only from a design standpoint, also from a technological one. All this awesomeness comes at a price. 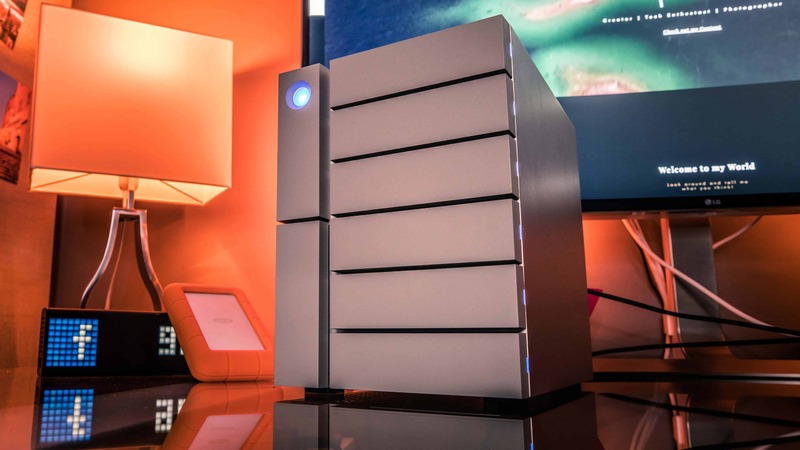 The LaCie 6 Big will rip a huge whole in your wallet. This Review will help you to decide whether LaCie’s stylish little cube is the right fit for you, or if you should check out other Solutions. As I said in the beginning the Design of the Lacie 6 Big is pure eye candy. All of Lacie’s Devices are a work of art. They are designed by Neil Poulton and this an absolute game changer. Normally you want to hide away all your IT equipment. That’s not the case with Lacie’s Products. But don’t be fooled by the LaCie 6 Big’s looks. This little cube has more to offer than just good looks. These days a lot of designers tend to create gear with a lot of plastic parts. Well not the 6 Big. This little fella throws 14 kilos into the ring. The weight of this device alone makes it special. The whole Body is made out of metal similar to Apples Unibody Design. All this weight benefits the noise level of the LaCie 6 Big. In my measurements I only picked up 37 dB. 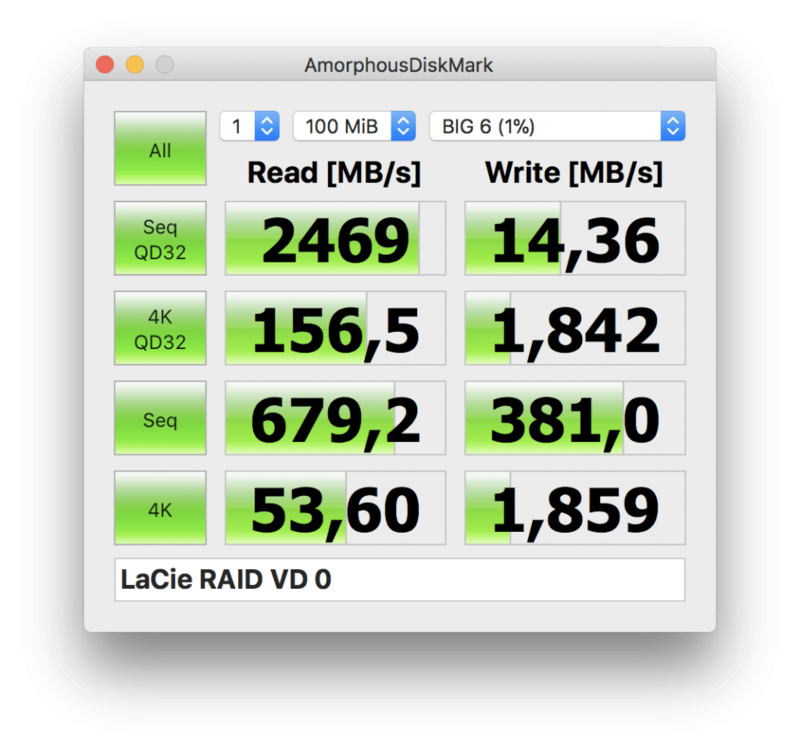 That’s just 3 dBs more than the LaCie 4TB USB-C Rugged External Hard Drive. This makes this Device extremely convenient and absolutely Desk worthy. Only average Performance with Pictures? 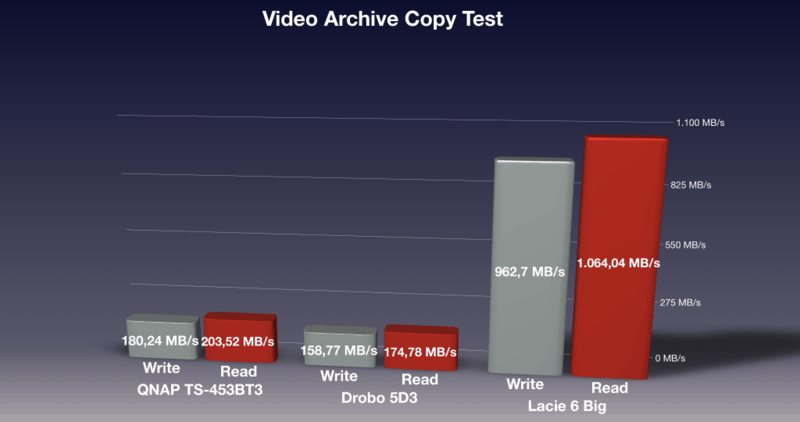 After I compared the Drobo 5D3, QNAP TS-453BT3 and the Lacie 6 Big I noticed a few interesting performance differences. 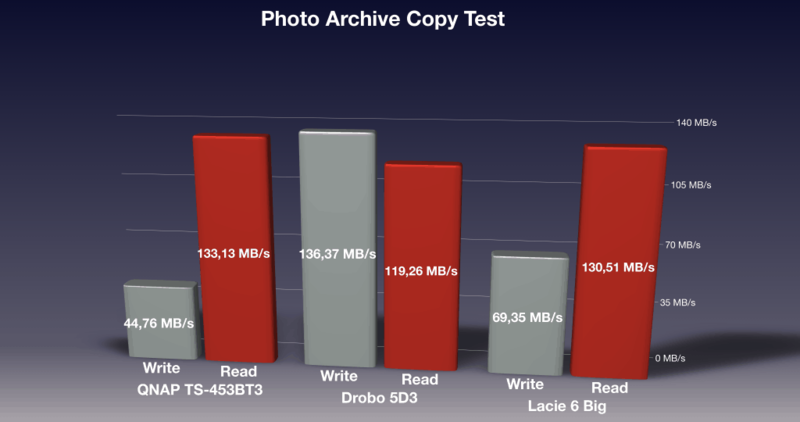 If you take a look at the Photo Archive Copy Performance, the Drobo 5D3 beats the other contestants easily. If you are a Photographer and you want an easy to use System, I absolutely can recommend the Drobo 5D3 for you. This changes immediately if you work with video files. The LaCie 6 Big obliterates its competitors. This performance plus speeds up your video edits significantly. I don’t need to wait for my renderings to catch up with my edit. I easily can throw three 4K 24fps streams from my Canon 5D Mark IV into Final Cut Pro on top of each other without any frame skips. Recently I reviewed the QNAP TS-453BT3 and the Drobo 5D3. Both devices come at a much lower price point and also offer Thunderbolt 3 connectivity. They focus on different customers than the LaCie 6 Big. So they could be a viable option if you are looking for something cheaper or you don’t that amount of performance. The LaCie 6 Big scored incredible 9800 Points in this review. This has a lot to do with it’s high Video IO Performance and the fact that you get 5 years of Data Rescue Services. The build quality of the 6 Big is impressive. Sure the Full Metal Body makes this build very heavy, but you also get an extremely quiet device through that extra weight. So if you are a Video Editor or you have huge amount of Data, the LaCie 6 Big has a lot to offer you and will without a doubt help you to increase your productivity. If you liked this review and would like to support me, feel free to check out my Amazon Links for the Storage Device I mentioned above.